AbbVie hosted a 'Cancer Moonshot Seminar' for the American Chamber of Commerce’s Innovation Committee in Sydney earlier this week. The seminar featured keynote speaker Dr Doug Lowy from the US National Cancer Institute (NCI) and a panel of local oncology experts. It provided an opportunity for attendees to learn more about how the NCI’s Cancer Moonshot initiative is driving developments in oncology research and treatment, and how Australia and the US can are collaborating to improve patient outcomes. The Cancer Moonshot initiative was launched in 2016 by Vice President Joe Biden. The US government is providing US$300 million every year over seven years to fund research initiatives that will accelerate progress in cutting-edge research and wider uptake of standards of cancer care. One of the initiatives stemming from the Cancer Moonshot is The Partnership for Accelerating Cancer Therapies (PACT) - a five-year public-private research collaboration totalling US$215 million launched by the National Institutes of Health, the Foundation for the NIH, the National Cancer Institute, and 12 pharmaceutical companies. PACT has focused its initial efforts on identifying, developing and validating robust biomarkers, standardised biological markers of disease and treatment response, to advance new immunotherapy treatments that harness the immune system to attack cancer. Current partners include AbbVie, Amgen, Boehringer-Ingelheim, Bristol-Myers Squibb, Celgene, Roche, Gilead, GlaxoSmithKline, Janssen, Novartis, Sanofi and Pfizer. Dr Lowy’s presentation was followed by a panel session featuring Professor David Huang of the Walter Eliza Hall Institute, Professor David Thomas from the Garvan Institute of Medical Research and Professor Roger Reddel from ProCan, Children’s Medical Research Institute. It was moderated by Erica Kneipp, the assistant secretary from the Office of Health and Medical Research. 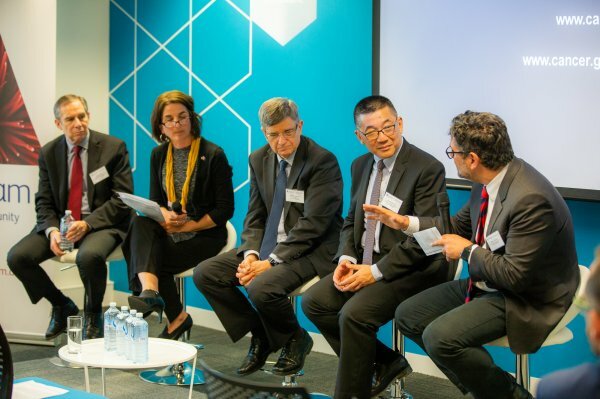 The discussion focused on the need to extend clinical trial uptake in Australia to progress research outcomes, the challenges and opportunities around data sharing, and how pre-competitive collaboration between companies is an important aspect of accelerating patient access to new therapies and improved diagnostics. Dr Lowy was strong about the need for the public sector to be at the forefront of discovery with great ideas and viable business plans. The panel agreed that there is a need for policy to encourage more risky start-ups and partnerships in Australia to drive those outcomes.